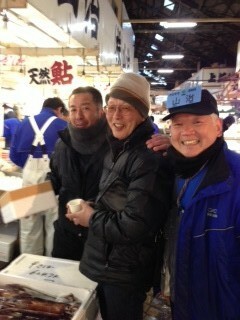 The master of the Japanese restaurant "Tokinoya" in Yokohama came for purchase this morning. Thank you for patronage. The left side of the photograph is "Mr.Jin. " of the total manager always patronized, and The right side of the photograph is "Mr.Saito" with the experience in lobster and crab's competing for 50 years. It is a master of "Tokinoya" to smile with the usual coffee of the landlady that it is between the two. Thank you for coming to a store early morning. It is "Yamaharu. " of a full smile from early morning.